Original Ballpark Style Popcorn Salt: Salt, modified food starch, FD&C yellow 5, FD&C 6, natural & artificial flavor, tricalcium phosphate added as anti-caking agent. Contains no trans-fatty acids. The popcorn that we have used is excellent. However, when I tried to pull the small sample bags from the package, two of them burst open. I'd suggest better glue or another method of display. It isn't fun to pick up pop corn from a display box like that. My order arrived safely a few days ago, and I have been enjoying a popcorn "snack" every night since then. I find that just 1 Tbs of popcorn with 1 Tsp of oil makes enough popcorn to eat as a snack before bedtime. The popcorn tastes so good that you don't have to shake the salt on it if you are on a salt restricted diet. I recommend this sampler whole heartedly. 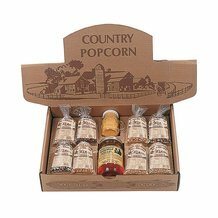 I ordered this as a Christmas present for my popcorn-loving dad. I was disappointed when it arrived and the canola oil had leaked out. Luckily, the oil was packaged separately in a plastic bag so it didn't get on the rest of the package. I called Lehman's and asked them to send another bottle of canola. The service rep was great and took care of the issue quickly. I was pleasantly surprised when they re-sent not just the canola oil, but the entire popcorn order. And it still arrived in time for Christmas! Even though there was a packing issue, Lehman's had great customer service, promptly and completely corrected the issue, and I was very pleased. This was my first order, but it won't be my last. My 2 popcorn samplers just arrived via UPS, and I couldn't be happier. I had read comments about the product arriving in some dishevelment, so I was a little anxious upon ordering--but the samplers were packed with the care that I have come to expect from Lehman's, and the product shift was minimal. While the individual bags aren't labeled, the inside box top clearly is, so it's easy to identify the different popcorn. 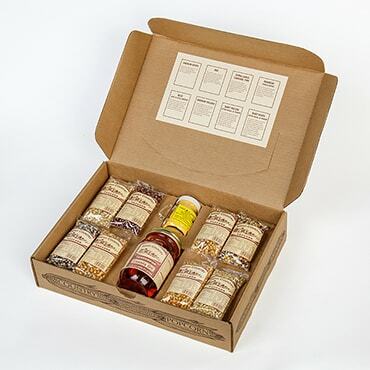 I ordered these samplers as gifts, and I know the recipients will be thrilled. Thanks, Lehman's! I ordered this popcorn sampler for the whole family as a Xmas thing. I received the popcorn box, opened it and found that the little bags of popcorn were jumbled up and there weren't any labels on the bags to tell which popcorn was which. I discovered then that my air popper was missing so I have to get another one to rate the popcorn. Or I'll try to use the popcorn oil on my stove. I'll let you know. 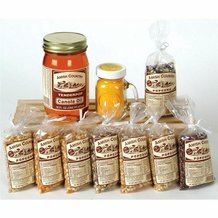 I bought this sampler as a gift for a family of popcorn fanatics-they had never heard of Lehman's and were totally rocked out by this sampler-I am looking forward to their comments after they try the different varieties-I think Lehman's has another customer for the future-If this sampler works as well as I think it will I will use it every year as a gift- It arrived on time and in place in the box-I had ordered something else as well and the box was secured well, labeled fragile to avoid breakage and I was well pleased with the timing of the shipment-Kudos to Lehman's~! I have only tried one so far, the rating may come up. I tried the blue, tough popcorn with lots of old maids. Hardly filled it to half. The oil and butter are good. 5th year in a row to have ordered these. It make a wonder gift, be sure to order one for your self, wonderful popcorn that pops and MADE in the USA. 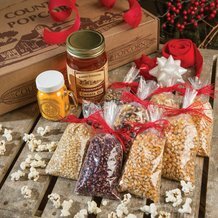 I get these every year for gifts, always get lots of Thank you's for this set of different corn and oil and movie theater salt. We like it our selves. This is a nice little sampler. Has some good varieties. Could do with out the varieties you can get at any grocery store. With my popper I can only get one batch of popcorn per bag. Good flavors. If you are experimenting than this is good for you. I grow some popcorn so was not overly impressed. Their is far superior popcorn you can grow your self with ease. Ordered as a gift. Came perfectly packed, would have liked the labels to say the popcorn type descriptions right on the bag but not a big issue. I expect the popcorn itself to be good quality. Great price for such a great selection! I loved trying out all of the different ones available. I loved the lady finger popcorn. Unlike a previous review, All of the products in my order arrived in excellent condition!!! My box was wrapped on the outside of the box with plastic and bubble wrapped. Can't say enough about the great job in preparing it for shipping! Since this set was on sale, I thought I'd give it a try. I'm halfway done sampling the popcorn, and so far, the caramel type is my favorite! It popped HUGE kernels, over-filling the dutch oven I used to pop it in. While I usually use an air popper, I made 2 other batches with the oil and the salt in the package...it brought back childhood memories!